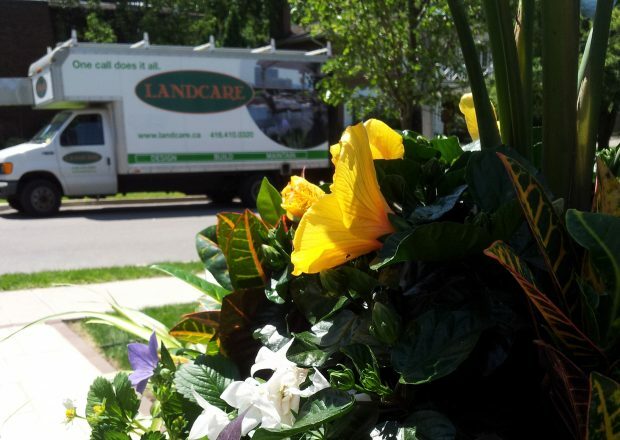 For over 25 years, Landcare has been providing high quality landscaping services to Commercial and Residential clients in the Toronto area. Each client benefits from our team of educated horticulturists, landscape designers, stone masons, carpenters and other landscape specialists and our dedication to providing top-notch customer service. Our award winning Design Team will work with you to create a plan for your landscaping project that meets your needs and budget. We are experienced with Commercial Property Master Plans, Residential Property Design, Green Roofs, and Garden Design. Our skilled landscape construction crews include experienced Stone Masons and Carpenters familiar with the latest materials and techniques. Our professional planting crews install anything from large trees, to professionally designed gardens, to annual planting displays and beautiful container arrangements. Our teams work together to complete projects from small garden installations to full landscape builds, green roofs, ponds and pools. Our full service Summer Maintenance programs have always been 100% organic for both Commercial and Residential properties. Summer Maintenance services (lawn and garden care, fertilization and pruning) run from mid-April to the first snow fall. Annual planting displays and container arrangements are offered as part of our Summer Maintenance service. Winter Maintenance programs run from Nov 15 to April 15. Our fleet is equipped to plow and do sidewalk work and snow removal for both Commercial and Residential properties. For properties that require it, we offer the latest in ice melting products. Always strive to deliver exterior maintenance and construction services with safety as a paramount consideration, better than our competition does, and better than we did in the past. We take care of the details and we aim to be masters of our trade. In so doing, we are selling our clients freedom to do what they want with their time and energy because they know that their property will look great. Our goal is to make the property look its best! Our mission is to do it organically! Our job is to do it efficiently! 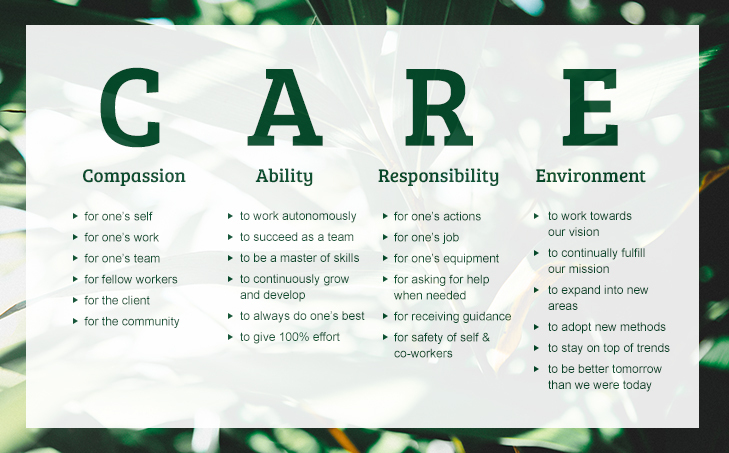 Landcare’s core values are illustrated through the acronym CARE. Our employees are taught to use this acronym in their decision making.